Home » Tech Tips » Apps » How to Schedule Emails in Gmail? Ever wondered on how to save your email messages and send them at a certain time period later? Email scheduling is one helpful approach which allows people to delay the delivery of composed email message until the given time frame. Though Gmail is the most popular email services, unfortunately this function is not part of standard interface in Gmail. You can maximum save the message as draft and then manually send it later. However, you can make this happen by relying on third party extensions. Related: Track real send of the Gmail message. Follow the instructions as explained below to schedule your emails for future without any hassle. Let us explain the process with the popular Google Chrome browser. Chrome Web Store has lot of amazing extensions and tools which can help you in managing your daily activities. Boomerang is one such extension available at Chrome Web Store allowing users to send emails, track responses and write better emails through AI support. Furthermore, another great feature of Boomerang is that it helps you to snooze or postpone incoming emails and bringing them back after a certain time frame as specified. Launch Google Chrome browser and go to the Boomerang extension page. Click on the “Add to Chrome” button and install the extension on your browser. After installation the extension will launch Gmail and prompt you to login if you haven’t logged in before. 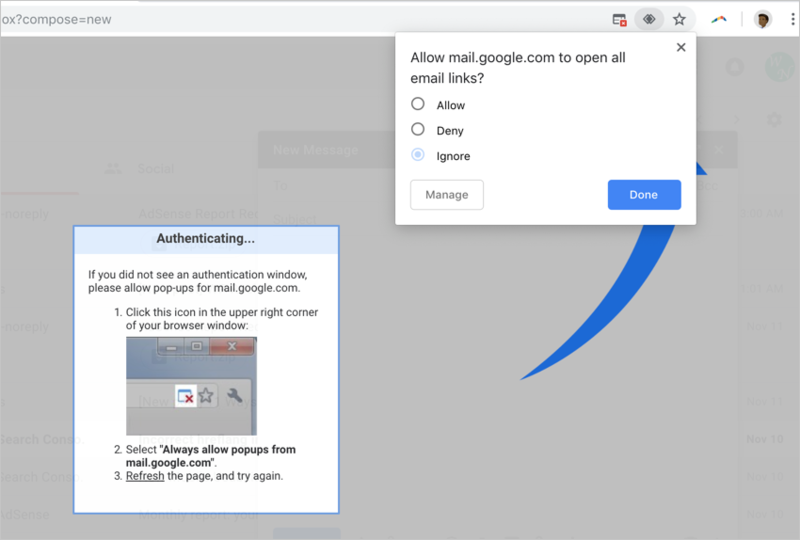 Launch Gmail by entering your email and passwords. 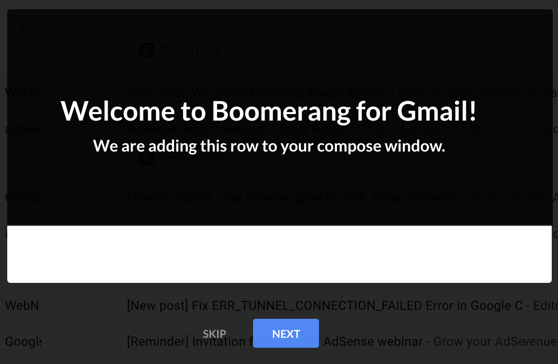 If you have already logged in, just refresh the Gmail page once the Boomerang extension is installed. Alternatively, click on the Boomerang icon next to the address bar on Chrome to launch your Gmail. You will see an introduction tour like below explaining the features of the extension. We strongly recommend you to go through the tour especially if this is a first time you are trying to schedule emails in Gmail. 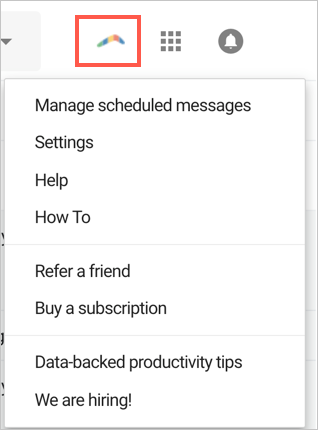 You will see some interface changes on your Gmail like “Pause Inbox” and “Boomerang Icon” are added as shown below. Next click on “Compose” button to create your email. Here you will see multiple options from Boomerang extension. 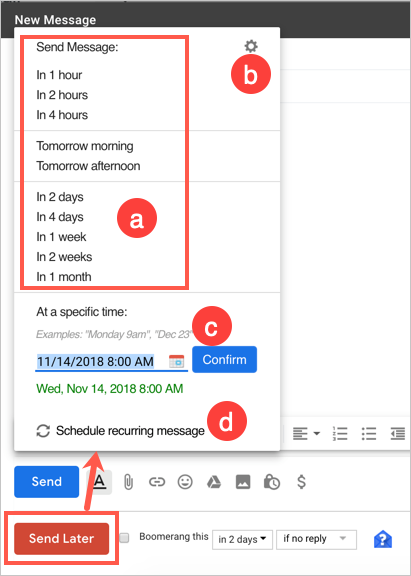 Click on the “Send Later” button to start scheduling a message. a. Click on the “Send Later” button to and setup a time for Gmail to send this email. You have lot of predefined options like for hours, days and tomorrow morning/afternoon. b. If you don’t find an option in the available menu items, then click on the “Gear” icon to add your own timing to the pre-existing menu items. 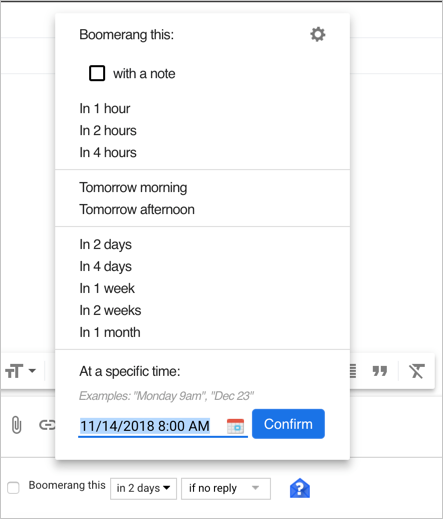 c. Click on the calendar icon under “At a specific time” and select custom date and time for the email to be sent out of your inbox. d. Schedule Recurring Messages – You can also schedule a recurring message and send it periodically. But this option needs an exception for service handler. Chrome will automatically block popup and service handler which you can authenticate to allow if required. Boomerang helps you to track your emails and do the necessary action depending on the response. Click on the “Boomerang this” check box and authenticate the Gmail service on Google Chrome. Choose the first dropdown box and select the days after which you want to recall the message. You can also enter a note for you to remember the return message. Choose the condition for recalling the message on the next dropdown box. You can return the email if there are no replies, no not clicked, if not opened or regardless of any situation. The help icon on the envelope allows you to request a read receipt for your email and tracks the clicks. Click on the “Boomerang Respondable” button to allow the extension helps you in writing a better emails using artificial intelligence. Related: Transfer one Gmail account to another. Once you have scheduled and sent an email, the extension will show additional menu items in the Gmail sidebar to manage your emails send with the extension. You can check the returned and sent messages using the menu items. You can unpause this option manually or set a time frame for enabling the emails again. Enable auto responder with a message. Get emails in a scheduled manner. Enable or disable delivering emails when the inbox is paused. You can click on the Boomerang icon on the top menu bar to get the required help. If you missed the introduction tour then click on the “How to” menu and go through the tour again. The developer also offers extensive FAQ which you refer when you are in doubt. If you are not happy, simply right click on the extension icon next to Chrome address bar. Select “Remove from Chrome…” and confirm the deletion of the extension. Refresh your Gmail and you will not see additional buttons from Boomerang anymore. You also need to go to your Google account’s security section and remove the data access for Boomerang to your account. If you are not using Chrome browser, Boomerang extension is also available for all popular browsers like Edge, Safari and Firefox. The free extension will allow you to send 10 messages per month. If you like the extension, check out the pricing plans to upgrade your subscription for sending unlimited emails. You can also use Boomerang apps on iOS and Android for scheduling Gmail messages from mobile devices. If you don’t want to use any browser extensions, click on the + icon on your Gmail interface right sidebar. 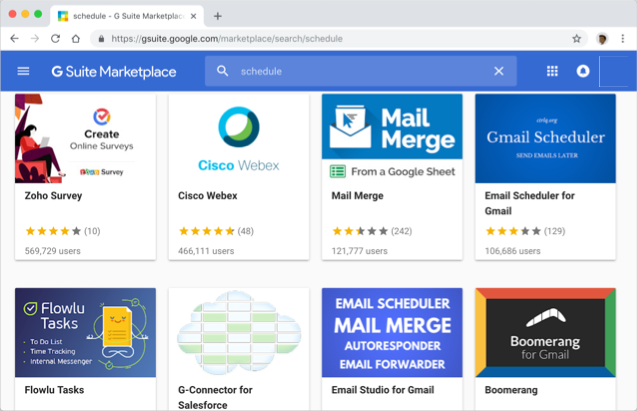 This will open G Suite Marketplace where you can find lots of add-ons for Gmail. Boomerang also offers two add-ons for admin and normal users with similar function like browser extension. There are many other add-ons like Gmail Scheduler and Email Studio which you can try for scheduling Gmail messages. Remember that Gmail extensions from Chrome Web Store or G Suite Marketplace will mostly work inside Gmail inbox of web or mobile interface. Scheduling emails in Gmail is not possible with the default interface and there are no solution from Google is available for this. The only way is to rely on browser extensions or G Suite Marketplace add-ons. Though these add-ons are free of cost for limited usage, you should upgrade to premium version for unlimited usage. So, if you are determined to manage your mailbox and schedule emails on regular bases, following the method as explained above will surely give you great support.